Ryan Christopherson excelled on and off the football field. 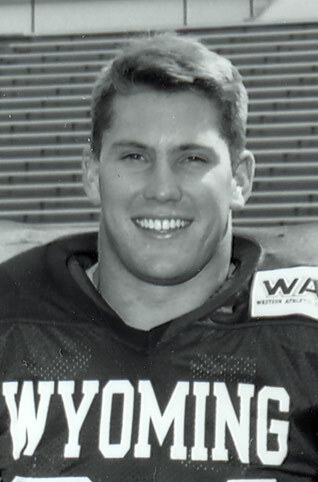 An Academic All-American, he became the most prolific running back in Wyoming history. Christopherson finished his illustrious Wyoming career as the school’s all-time rushing leader with 2,906 yards. He also is the single-season rushing leader with 1,455 yards, which he gained as a senior in 1994. His 244 yards gained against UTEP in 1994 is the second best single-game effort in history. He owns the career record for total carries, 585, and for carries in a game, 37 vs. Northeast Louisiana in 1994. He is only the second running back in Cowboy history to gain over 1,000 yards twice during his career. Christopherson was an All-Western Athletic Conference first-team selection as a senior. He was a four-time WAC Scholar Athlete as well as a four-time Academic All-WAC first-team selection. He was a first-team Academic All-American as a senior, and a second-teamer as a junior. He was a team captain as a senior. He played in the NFL for the Jacksonville Jaguars, Arizona Cardinals and Denver Broncos.